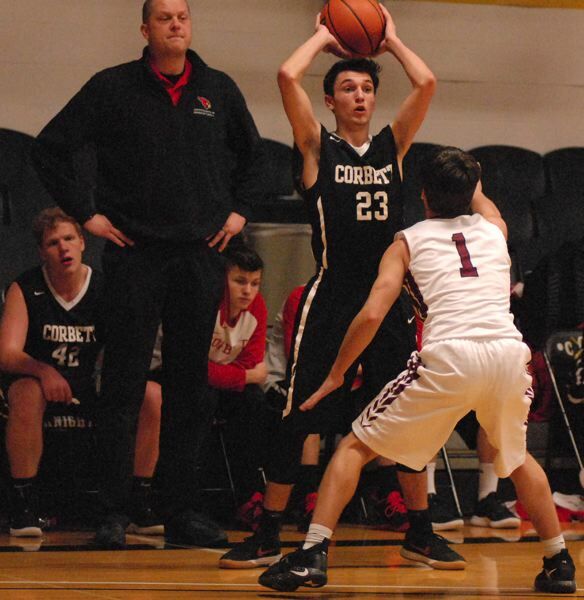 The Corbett boys basketball team looks to climb a few rungs on the Tri-Valley Conference ladder and put itself into playoff contention this season. The Cardinals are 5-6 so far in the preseason with the league schedule starting up at home against Madras in two weeks. "This is a hard-working bunch with a lot of potential," Cardinals coach Don Carter said. "We have had to work a lot of new guys into the lineup, so there have been some growing pains as we work everyone into their roles, so that we can be successful once we get to league." Leading this year's crew is third-year starting guard Dylan Paintner, who was the team's main scoring threat last season. "Dylan has continued to work over the summer to improve his skills," Carter said. "He has some pieces around him this year that will take some of the scoring pressure off his shoulders. I will be relying on him as our leading defender to set the tone for the rest of the team." Junior Josh Newton moves into the point guard position. "He sees the floor well and is a good shooter from deep," Carter said. The biggest change for this year's team is an influx of size with three players measuring in at 6-foot-3 or taller. Spencer Zeise and Mason Wright have shared time in the post through the preseason, giving the Cardinals a scoring threat on the block. "Both of our bigs are smart and can run the floor," Carter said. "I would look for us to be entering the ball into the post much more than we have in the past and for our guards to work off of that." Senior Preston Horvath plays on the wing and has a long arm span that can disrupt the passing lanes. "He brings us a long athletic body that can bother people on defense, and he can score on the offensive end," Carter said. The Corbett girls bring a young lineup to the floor with more than half of the varsity spots being filled by freshmen and no senior on the roster. "That's what is so fantastic. They have yet to peak, they are eager to learn and they are working hard — there is so much potential," Corbett coach Rosalie Contri said. In her third season, junior guard Olivia Fritz brings the most experience to the squad after watching her older sisters also come through the program. "She's not afraid, and she plays with confidence," Contri said. "She has the ability to attack the hoop — her crossover is amazing." The team's other junior is 5-foot-10 post player Sydney Smith, who has expanded her scoring range over the off-season. "She worked hard on her game over the summer and developed a consistent shot from the elbow," Contri said. "In the past she has been a role player for us, and now we are asking her to be a scorer." Among the six rookies, Isabelle Van Hee has earned the point guard spot and will direct traffic for the Cardinals. "She doesn't just handle the pressure, she heads right for it," Contri said. Grace Merrill is the team's tallest player at 5-foot-11 and will look for her volleyball skills to translate to the basketball court, while Sydney Schimel and sophomore Kailyn Johnsen are scoring threats on the outside. "We are keeping it simple and allowing our young players to establish some synergy with their older teammates," Contri said. "Once they figure out how to play with each other we will be a very good team." Sophomore Payton Horvath has earned the assignment of being the team's stopper on the defensive end. The Cardinals are 2-9 so far in the preseason, but three of those losses have come in one-possession games. "We are trying to turn this team into a pack of wolves," Contri said. "They have that desire to go get that 'W', they just need to learn how to win. They are motivated to grow, so when it comes time for league we'll be ready to go."